John and Margie Porter will celebrate their 60th wedding anniversary tomorrow. 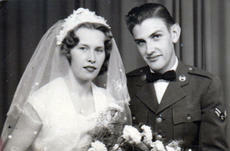 They were married June 9, 1956 in Wiesbaden, Germany. “Certainly no bread in America has been more popular over a longer time than baking powder biscuits. In fact, in many homes they were baked three times a day in great quantities, and were eaten hot, with butter and honey or preserves, along with every meal.” James Beard, 1881. The sun is shining and the first week of June has slipped by me while I wasn’t looking. Fay said they finally got some garden planted, as did Billy Ballenger. Tomatoes and corn will be a little late this year. The weatherman said no rain this week so they were headed for the hay field this morning, as are most of the farmers in this area. We were greatly blessed Sunday as Linda led our music and sang a special with MiKayla. Also, appreciate testimonies shared by Linda and Glenna. It is great to be bold in sharing how God has worked and is working in our lives. Bro. Bill’s message was from Exodus 2:1-10 entitled “An Example for Today.” It focused on what to do when we’ve done all we can do. Sunday evening we watched movie “Risen” and then celebrated Glenna’s birthday. I love yoga – pants. Soft, comfy and forgiving. They’re great to wear around the house or to bed. They’re especially great to wear before, during and after you stop at the store and bring home a vanilla creme bundt cake and maybe slice into it one or 12 times too many. Not that I’ve ever done that, but if I do, I’ve got the perfect pants for it. Yoga itself I don’t know well enough to love. I love the idea of it, of wearing the clothes and being in a space that’s usually beautifully lit and serene. You know you’re getting old when you skip the health foods because you realize you need all the preservatives you can get. You know you’re getting old when, if you fall, you wonder what else you can do while you’re down there. You know you’re getting old when you come to realize time may be a great healer, but it’s a lousy beautician. I’m not sure who authored those lines, but I found them quite amusing. They also got me thinking about what the Bible says about the aging process. I have a very small arsenal of insecticides and what I do have are considered bio-insecticides. Bio-insecticides are derived from naturally occurring microorganisms like bacterium. They also include plant oils and compounds (like neem oil which acts as both an insecticide and fungicide), viruses and protozoa. When we use a bio-insecticide we are essentially using nature to eat nature. The Owen County Council for the Arts is partnering with the city of Gratz to present the eighth annual spring arts festival. This year’s “Arts in the Park” will be held in Gratz, along the banks of the Kentucky River. It will include lots of possibilities to be on the river as well as near it, as the event celebrates the impact of the Kentucky River on Owen County and showcases its artists, craftspeople, music and food. The festival will take place rain or shine from 10 a.m. to 5 p.m. on Saturday, June 11. With dogged and unflinching determination they met the enemy, and many gave their lives for a cause in which they believed. A great tragedy unfolded when the enemy was a member of a soldier’s own family, and during the Civil War, this scenario was played out between more Kentuckians than any other people of the United States. The Memorial Service for Aunt Bess, after months of planning by her daughter Ellen via phone and email from her home in Missouri, came together beautifully Sunday.